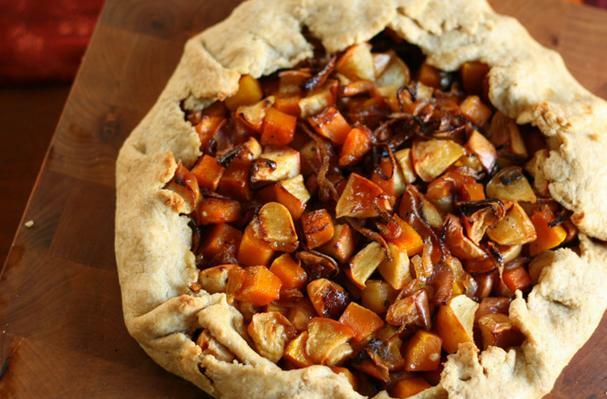 Place squash, apples, and onion onto a rimmed cookie sheet. Toss with the oil, then spread them out in a single layer. Roast in the center of the oven until everything is tender and beginning to turn golden (and even darker) in spots, about 35-40 minutes. Remove from the oven and let it cool until room temperature. TIP: You can do this a day ahead of time. Simply store the roasted bits in the fridge, covered, until ready to use. Preheat (or reduce temperature) to 375 degrees F. Whisk together the maple syrup and the mustard in a small bowl. Set aside. Bake in the center of the oven for about 25 minutes, until the crust is golden brown. Let it sit for 10 minutes or so before slicing. (It stays together better that way) Cut into slices and sprinkle some Parmesan shavings over top. 1. You could also use frozen butternut squash chunks if you like. I would thaw them first and drain any excess moisture before roasting. 2. You could also whisk an egg and brush it around the edges of the pie crust. That helps it to brown more beautifully.